THE WIT OF GROUCHO MARX « THE BRYCE IS RIGHT! – The art of language. 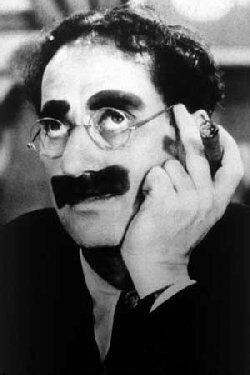 The king of oratory though was Groucho Marx of Marx Brothers fame. Whereas his brother Chico portrayed an Italian, and Harpo the fun loving mute, Groucho was charged with keeping the dialog moving along with wise cracks. His genius was his ability to twist grammar and capitalize on the double entendre of the English language. As a listener, you had to pay attention or you might miss one of his throw-away lines. You just couldn’t see it coming. By doing so, he exhausted listeners due to the mental gymnastics he put you through. That joke went over a lot of people’s heads. I also saw him participate in a roast of Johnny Carson at the Friar’s Club. His description of his dressing room was excellent, and the video is available on YouTube. I’m still amazed how many people never got it. Through his use of the English language, Groucho exhibited a playfulness with his audience which endeared them to him. Sometimes his comments were suggestive, others were more innocent. He never had to be crude to captivate his fans, he just had to make them think. LAST TIME: THE AGE OF DARKNESS – Are we still seeking truth and knowledge, or are we pacified by the status quo? This entry was posted on March 21, 2014 at 6:00 am	and is filed under humor. Tagged: Florida, palm harbor, The Bryce is Right, THE WIT OF GROUCHO MARX, tim bryce. You can follow any responses to this entry through the RSS 2.0 feed. You can leave a response, or trackback from your own site. Dumont: Are you sure you have everything ? Groucho: Well, I haven’t had any complaints yet !